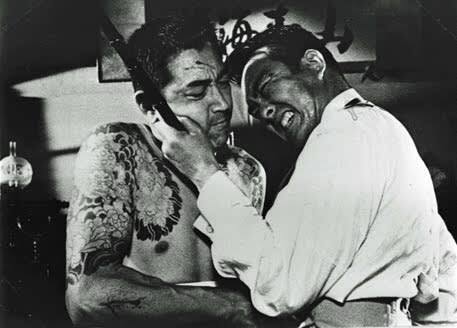 Koji Tsuruta, often considered the yakuza genre’s first star, kills it in the savage classic Blood Of Revenge. The story takes place iin Osaka, 1907; Asajiro (played by Tsuruta) must keep his business functioning smooth like cream, keep his late oyabun’s hot-blooded son in check, and deal with his emotions for a beautiful geisha named Hatsue (Junko Fuji). Director Tai Kato skillfully seizes every moment of conflict, and succeeds in displaying rampant blood-gushing.